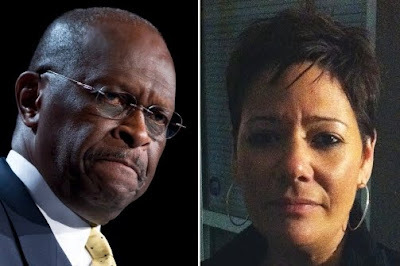 As you may know by now, Republican presidential candidate Herman Cain suspended his campaign after persistent questions about his alleged 13-year affair with Ginger White. In an interview with The Daily Beast, White gave details about the affair and discussed her own problems with sexual harassment in the workplace. There are so many things that disturb me about this story. Please read the article - the entire article - here. hmmmm. It pays to be pretty. White told Bennetts that "getting men to supplement her income that way started becoming a game." She said: “It was easy for me to get help like that.You have to be just as clever as they are, just as cold as they are, just as calculating as they are — and sometimes beat them at their own game. But I don’t want to be depicted as a woman who sleeps with men for money. I am not that woman." White has been married three times and has two children by her first husband. I ask: Was there no one else in her life that could help her out — Family? Friends? Maybe she had too much pride or was too embarrassed about her financial situation to reach out to those close to her. I don't know. But do you think White was a victim or was she just playing the same game men play? They were able to get want they wanted and she was able to get her bills paid. Anyway, please read the story and let me know your thoughts. Haven't read the whole story yet, but I know quite a few women who play White's game. They are women used to getting what they want based on their looks. The problem is that will only get you so far and can often become a crutch down the road. When that crutch is gone -- looks have faded, weight has been gained or you're not as youthful as you once were, you then become the victim. It's all fun and games until you get old enough that you should know better than to depend on people who use you. This is on another note. I'm having a big problem with her assessment of Gloria Cain. Whether or not Cain's wife knew is really none of her business or anything for her to be concerned about. If it makes White feel better to think that Cain's wife knew, fine. But it still doesn't take away any immoral decision-making on her part. White is NOT a victim, she was playing the game. She also made herself look disgusting. She'll be hard pressed to find someone else to go for her game. She needs to get a job and take care of herself.